What is Kufic? Kufic script has been one of the earliest forms in which the Holy Quran was hand written and recorded. This angular, slow moving, dignified script has also been used tombstones, coins and inscriptions on buildings. Who is Vahid? Vahid Jazayeri (@KuficCalligraphy) is an established calligrapher, researcher, graphic designer, and expert in early Arabic Kufic script. 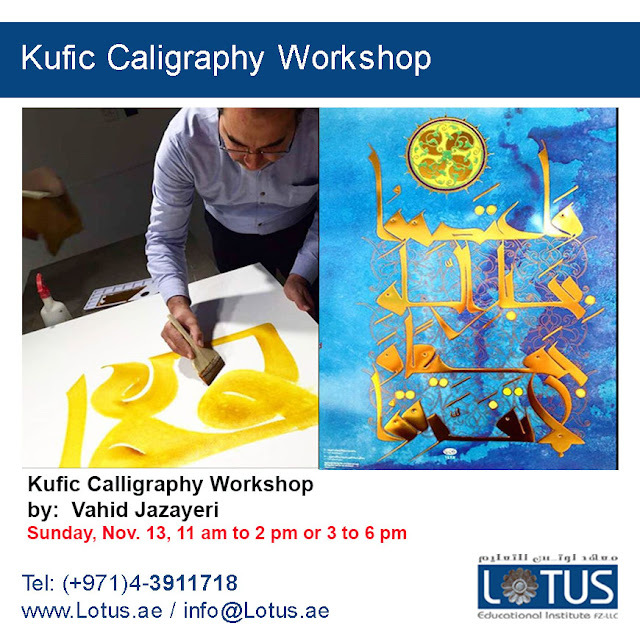 He holds a Bachelor of Art in Graphics and has been awarded the Excellence in Art Certificate by the ministry of culture, the equivalent of an honorary Ph.D. Vahid (@KuficCalligraphy) began his study on Thuluth script in 1982 and his study on Naskh scripts in 1991. After nearly ten years of training he began teaching and within a year he was developing two complementary fields: historical calligraphy in a range of media and contemporary type design.